Sri Kudali Mahakshetra is a small village situated 14km from the district centre of Shimoga, in Karnataka state of India. 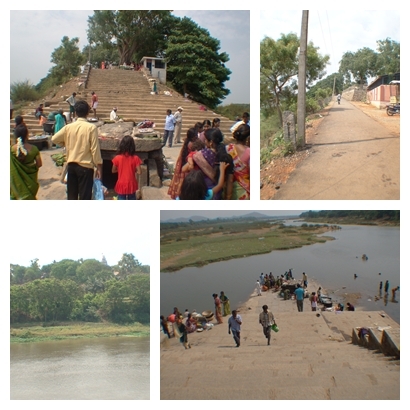 One can reach this place by travelling up to Shimoga both by rail or road and thereafter by road alone. The road from Shimoga is a fairly good and motorable one. Those who travel by their own vehicle, can also reach this place via Tarikere, Bhadravathi and Holehonnur. The greenary all around makes the journey a pleasant one. Kudali main centre, a small village is located 14 km north east of the district centre of Shimoga in Karnataka state. River Tunga enters the village from south and flows westwards. 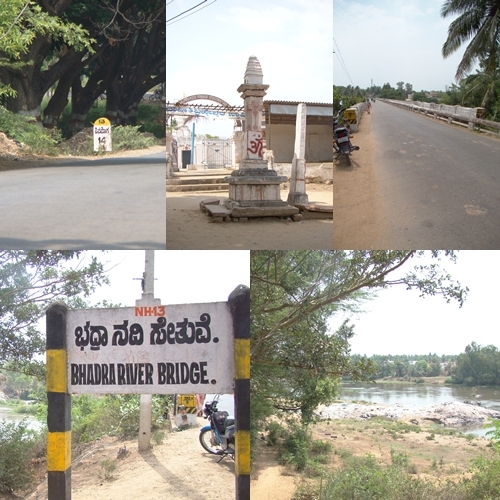 The river Bhadra enters from the South-East, through Holehonnur, flows east of the village and converge with Tunga, flows northwards, thereafter is known as Tungabhadra. In Hindu scriptures, this place was called as Yamalapuri. These two rivers viz., Thunga and Bhadra originate in Varaha Mountains in Sahyadri range of Western ghats, encircle the village Kudali and flow as a confluent thereafter. This is why this place is known as Kudali, which means confluence of two rivers. This kshetra was the Tapobhoomi (meditation land) of the famous sage Galava. 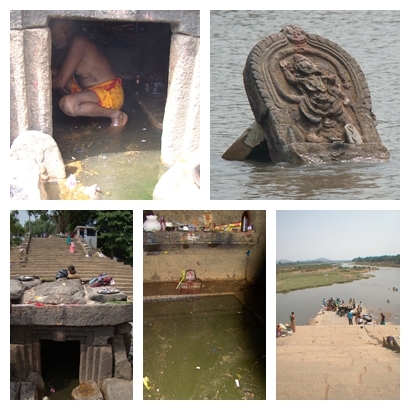 It is claimed in the puraanas (legends) that Tunga was the visage of Narayana, while Bhadra that of Shiva. At the point of confluence of these two rivers, there is a “Udbhavalinga” (Linga rises on its own from the earth) called “Sangameshwara”. 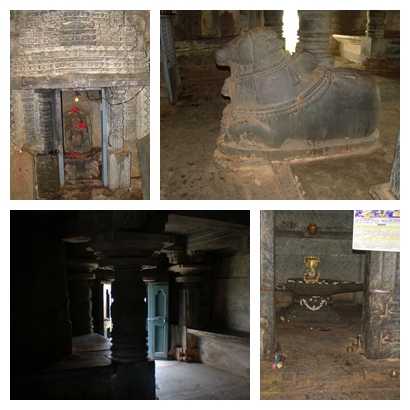 On the banks, there is a temple of Ramanathalinga, as well a temple of Vishnu who blessed his renowned devotee Prahalada in the form of a miniature sized “Chitamani Narasimhaswamy”. 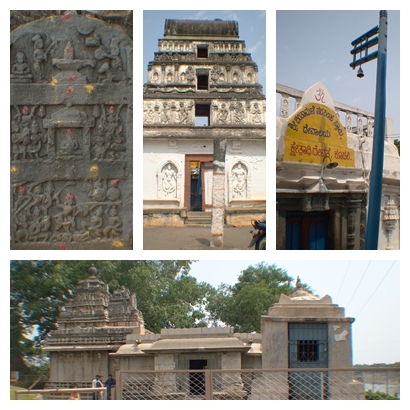 At the southern end of the village there is a temple of Brahmeshwara established by Lord Brahma himself. This kshetra is also well known as, ‘Narasimhakshetra’ as one of the deities is ‘Narasimhaswamy’, ‘Dakshina Varanasi’ (Banaras of the south) due to the existence of a temple of ‘Lord Shiva’ on the banks and called Mahaprayaga, due to the confluence of the two rivers. There exists a hill to the east of Sangam. Now it is known as Bhairanabetta. There is a temple of Kalabhairava on the hill. Thus the name for the hill. This was known as Dronaparvatha in the ancient purana (legends). This Kudali kshetra has an impact over a distance of six kilometers that includes the hill. Generally the Kshetramahime (Speciality of the place) is restricted to the physical area of that particular kshetra. However, it is said in the puranas (legends) that the Kshetramahima of this place is spread over a distance of 6 km (Knosa dwaya), there by indicating the greatness of this Holy place. Building of Sri Kudali Sringeri Dakshinamanya Sharadapeetham and the temples of the deities of Sri Sharadamba and Sri Vidyashankara are located close to Sangama. Srimachhankara Bhagavatpada defeated Mandana Mishra believed to be the incarnation of Brahma and his wife Ubhayabharati, incarnation of godess Saraswathi, in a debate. As per the terms of the debate, defeatist Mandana Mishra renounced the world and became the disciple of Sri Shankara and was renamed as Sureshwaracharya. Ubhayabharati decided to return to her world since Mandana Mishra renowned the world. At that moment Sri Shankara bonded her with Vanadurga verses and prayed her to settle down at the proposed Dakshinamnaya Peetham in the south. She consented to the request with a condition that she would be following Sri Shankara, but would not move further if he looks back. At Kudali Sangam, since the Acharya did not hear the sounds of the auklet bells of Ubhayabharati, he looked back with anxiety. The next moment Ubhayabharati stood her grounds as if rooted as per the terms of agreement. Since then she has settled down in that very place and is being worshipped as Sharadadevi. From this unexpected incident, as Sharadadevi decided to stay at Kudali, the Acharya again prayed her to go along with him to Sringeri. Accepting his request, Sharadadevi agreed to reside in Sringeri with complete grace only during Navaratri festival and symbolically on other days. Accordingly, even as on now, Sharada is in a sitting posture in Sringeri. Sri Adishankara established four monasteries in the four directions of the country and assigned a pontiff to each one of them for the smooth functioning of Vaidika dharmoddhara work. In the south, he established Sharadapeetha at Sringeri for the Propagation of Yajurveda and assigned this responsibility to Sri Sureshwaracharya, who thus became the First pontiff. Under this tradition, Sri Narasimha Bharati III enthroned the peetha at Sringeri as 46th Pontiff in 1546. From 1546 to 1556, he stayed at Sringeri, looking after the responsibilities of Sharada Peetha. In between, as per the tradition of the mutt he selected a disciple, induced him to renunciation initiation and christened him as, “ Sri Vidyaranya Bharati Swamigalu”. The senior swamiji then decided to visit all the holy places and left Sringeri in Nala Samvatsara in 1557AD, on a pilgrimage. Before leaving, he made all the necessary arrangements for the smooth functioning of the mutt and handed over all the responsibilities to Sri Vidyaranya Bharati Swamiji. The senior pontiff, after leaving Sringeri, visited one after another-holy places and spent almost 20 years in pilgrimage. Back in Sringeri, the concerned did not get any message about the whereabouts of the senior pontiff for almost 12 years. During this period, there was fall of Vijayanagar Empire. This brought problems to Sringeri mutt and to its properties. Due to the misunderstanding between the locals and the junior swamiji, he left Sringeri to Kudali where he started living in the old mutt. Thereafter, the management of the mutt and a few leaders thought that the absence of a pontiff is an insult to the mutt and hence brought a new person to head the mutt and christened him as Sri Ramachandra Bharati Swamiji and accepted him as their guru. In 1576 Sri Narasimha Bharati III while returning to Sringeri after 20 years of pilgrimage, touched Kudali and rested there. Surprisingly, he met his disciple and the successor Sri Vidyaranya Bharati Swamigalu, to whom he had handed over the reins of the mutt at Sringeri, and learnt all the developments. Since this was the place where Sharadamba first stayed, he decided to stay there and did so accordingly. In no time, the news of Sri Narasimha Bharati III staying at Kudali spread everywhere the surrounding Paalegars (Chieftains) as well as his disciples came rushing for his darshan. They informed the senior pontiff about the happenings at Sringeri and also about the new pontiff. The chieftains and the disciples requested him to stay at Kudali and bless them. They also promised to provide all the required amenities to the pontiff. While this was the general opinion of his followers, the pontiff too, did not wish to hurt their feelings. Moreover, the junior pontiff, whom he had picked and initiated to the peetha, was already staying there. More than anything else, the service atmosphere, natural beauty, the two rivers and their confluence attracted him and the virtual presence of Sri Sharadamba drew him close to that place. Ultimately he decided to stay in Kudali. The disciples felt happy after knowing the decision of the senior pontiff. The chieftain of Basavapattana Sri Hanumappa Nayak got built a big building for the mutt and temple to Sri Vidyashankara and also donated fertile lands. The other chieftains followed suit, built several buildings and enhanced the assets of the mutt. Thus, as the mutt received new buildings and land, with the full co-operation of the disciples, the swamiji arranged special poojas in the local temples, performed Mahabhisheka and Special Poojas to Sri Vidyashankara, Valukaparameshwara, Ratnagarbhaganapathi and did Annadaana to all section of the society. Then, in the presence of learned men, chieftains, special invitees and the followers of the mutt established Dakshinamnaya Sri Jagadguru Sharadapeetham in Kudali permanently on 22.10.1576, the day of Karthika shukla balipadyami. The Kudali Sringeri Mahasansthanam is permanently stationed there since that day. Srimad Jagadguru Sri Kudali Sringeri Shankaracharya Mahsamsthanam. First Visit Sri Kudali Sringeri Shankaracharya Mahsamsthanam. Then Visit Sri Sringeri Sharada Peetham. Sri Kudali Sringeri is the Moola Sthana of Goddess Sharadamba, this is reason behind visiting Sri Kudali Sringeri First. Goddess Sharadha is in Yantra Swaruppa. Here Goddess is Facing in North (Uttara) Direction. Here Goddess idol is made up of stone. Goddess Niluvaambha Sharadha Stays Here. Goddess Sharadha is in Mantra Swaruppa. Here Goddess is Facing in East (Purva) Direction. Here Idol of Goddess is not made up of Stone. Only on occasion of Navarathri Goddess Sharadha Stays here. The name Saraswati comes from saras (meaning "flow") and wati (meaning "she who has flow"). In Konkani, she is referred to as Sharada, Veenapani, Pustaka dharini, Vidyadayini. In Kannada, variants of her name include Sharade, Sharadamba, Vani, Veenapani in the famous Shringeri temple. In Tamil, she is also known as kalaimagal, Kalaivaani, Vaani. She is also addressed as sharadha, Veena pustaka dharani, vaakdevi, varadhanayagi and many other names. She is also known as Sharada, Vani and Vagdevi (all meaning "speech").